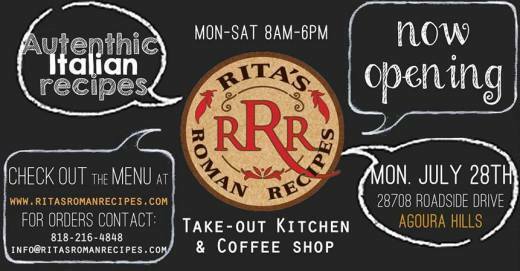 On Monday, July 28th, Rita's Roman Recipes Take-out Kitchen and Coffee Shop wil open its doors at 28708 Roadside Drive, Agoura Hills, in the Yamato/Agoura Fitness center, for breakfasts, lunches and take-out dinners. Rita’s Gourmet Catering has been doing private catering events since 1989. In the 1990’s Rita’s Gourmet Catering began branching out into school lunch programs serving campuses all over Southern California. Rita's Roman Recipes was the name created to expand the company's products into farmers' markets in Venice an Atwater Village. But on Monday, for the first time, Rita will open this take-out kitchen and coffee shop here in Agoura Hills. To learn more, visit www.ritasromanrecipes.com or call 818.216.4848.